Climate change is the most pressing issue of our time, and it is deeply interconnected with other major problems we face as a global society. We face social challenges, such as waves of displacement and migration around the world due to conflict and economic hardship exacerbated by poor environmental conditions. We face acute threats to biodiversity and ecosystems that fundamentally support life on our planet as we know it, as well as pressure on natural resources that power our economies and ways of life. Through all of these issues, we see a common thread of differentiated impacts for women – climate change can worsen existing gender-based inequities that keep women impoverished and marginalized. With increased stresses we see violence against women who are refugees or environmental advocates, as well as economic conditions that leave women in poverty. At the same time, women are stepping up to lead on climate change issues, and focused efforts to consider gender in climate initiatives are creating new paths to progress. Indigenous women are asserting leadership in their communities as protectors of nature and culture. Young women are showing up and speaking up to push society toward a livable future that they have a direct stake in. 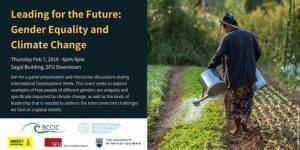 Women are stepping forward in all areas, including to support the issues of people who are gender minorities, and men are also supporting initiatives that focus on gender as a way to address some of the worst aspects of climate change impacts.